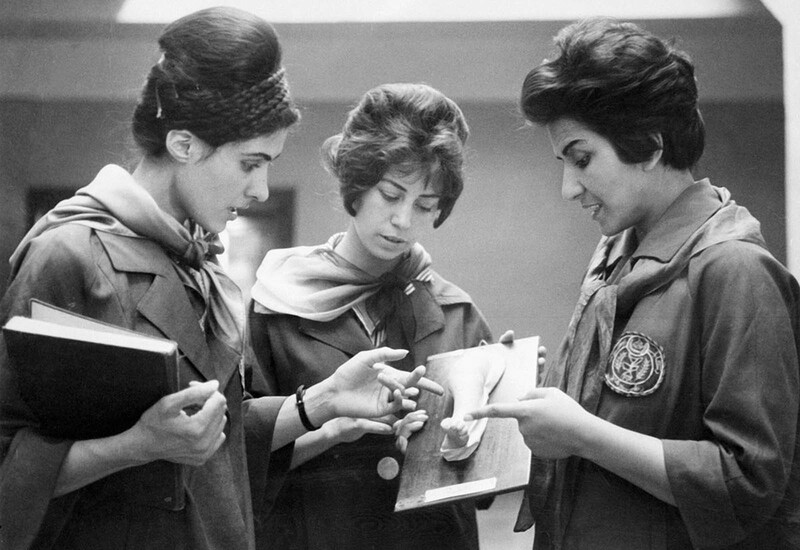 Picture taken in 1962 at the Faculty of Medicine in Kabul of two Afghan medicine students listening to their professor (at right) as they examine a plaster cast showing a part of a human body. 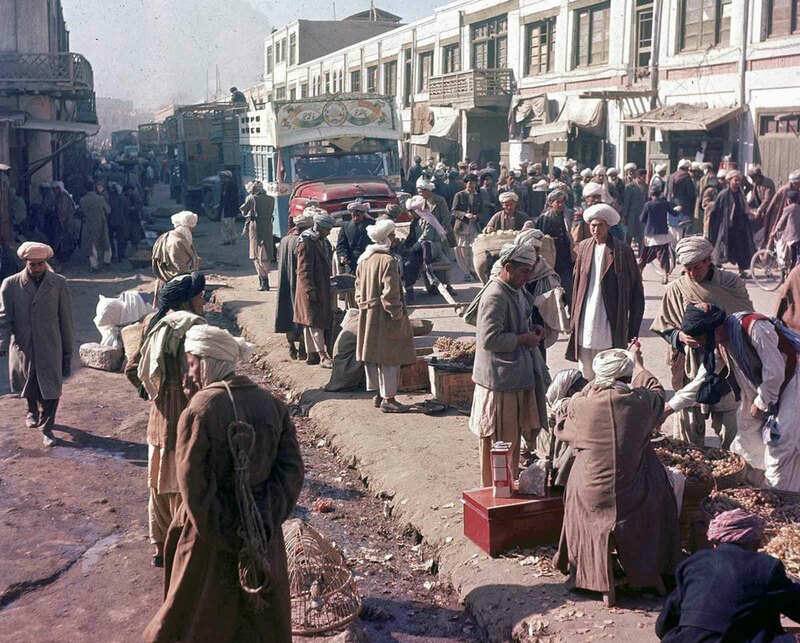 This is Afganistan of 1950s and 1960s. Lots of people would think that they will see pictures of wild, underdeveloped and medieval country with lif econditions worse than now. Think again. 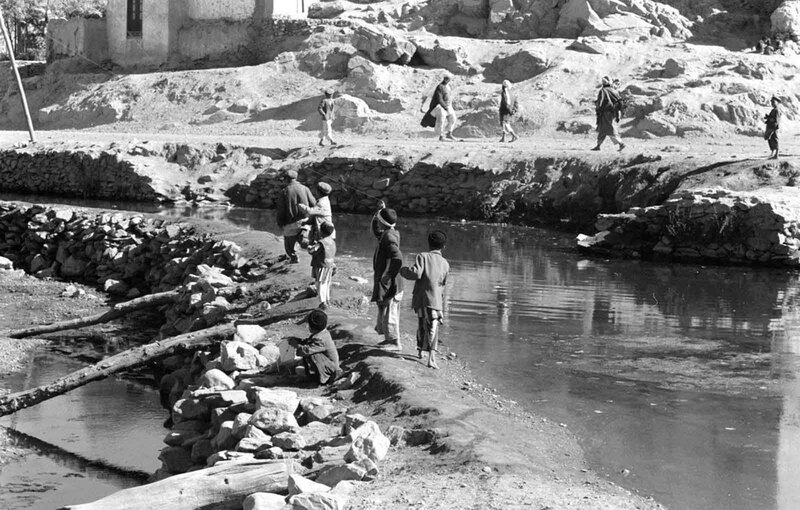 Fractured by internal conflict and foreign intervention for centuries, Afghanistan made several tentative steps toward modernization in the mid-20th century. In the 1950s and 1960s, some of the biggest strides were made toward a more liberal and westernized lifestyle, while trying to maintain a respect for more conservative factions. Though officially a neutral nation, Afghanistan was courted and influenced by the U.S. and Soviet Union during the Cold War, accepting Soviet machinery and weapons, and U.S. financial aid. This time was a brief, relatively peaceful era, when modern buildings were constructed in Kabul alongside older traditional mud structures, when burqas became optional for a time, and the country appeared to be on a path toward a more open, prosperous society. Progress was halted in the 1970s, as a series of bloody coups, invasions, and civil wars began, continuing to this day, reversing almost all of the steps toward modernization taken in the 50s and 60s. 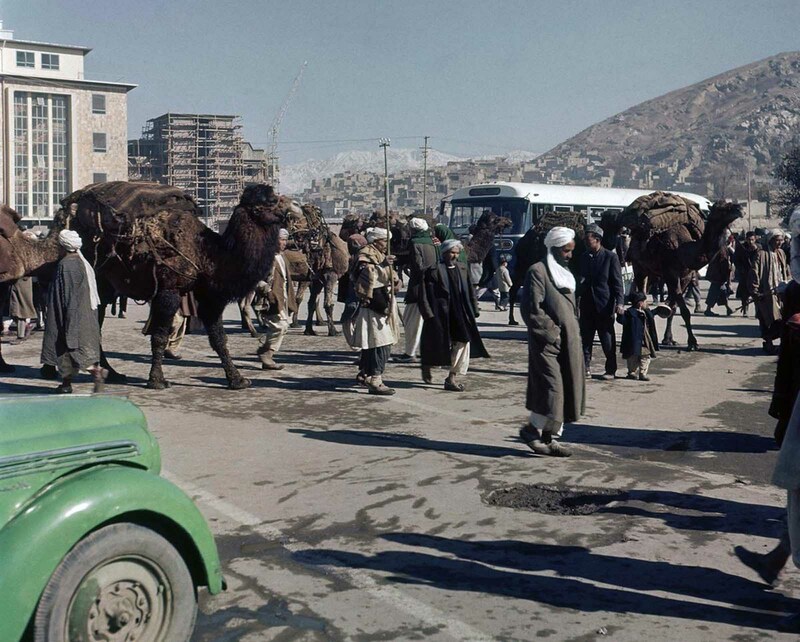 Men stroll past roadside vendors as a painted truck makes its way through the busy street in Kabul, Afghanistan, November, 1961. 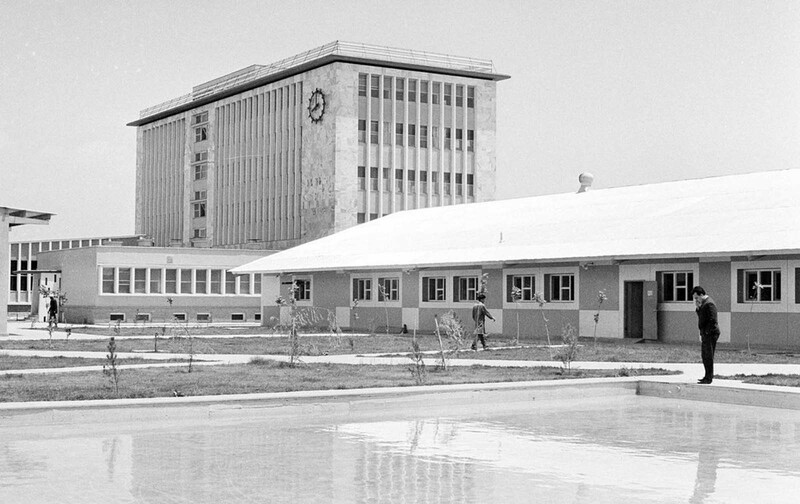 The modern new (completed 1966) government printing plant in Kabul, on June 9, 1966, which houses Kabul Times. Most of its machinery was furnished by West Germany. 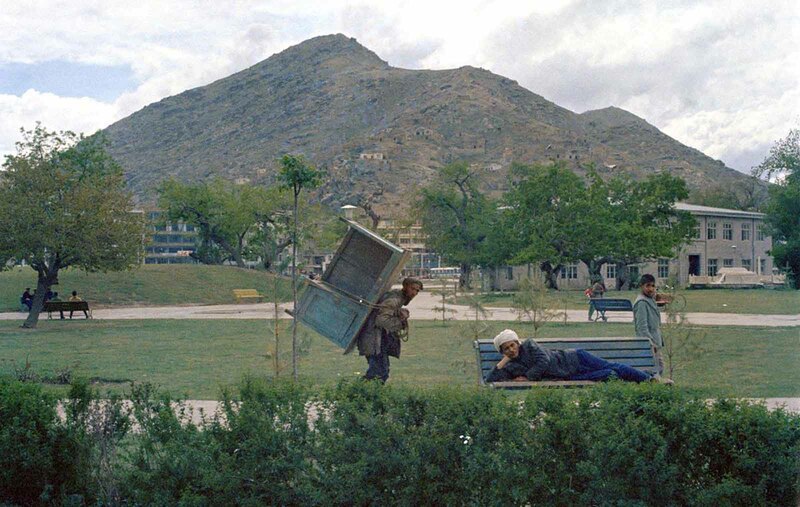 Architecture in Kabul, Afghanistan, seen on May 28, 1968. 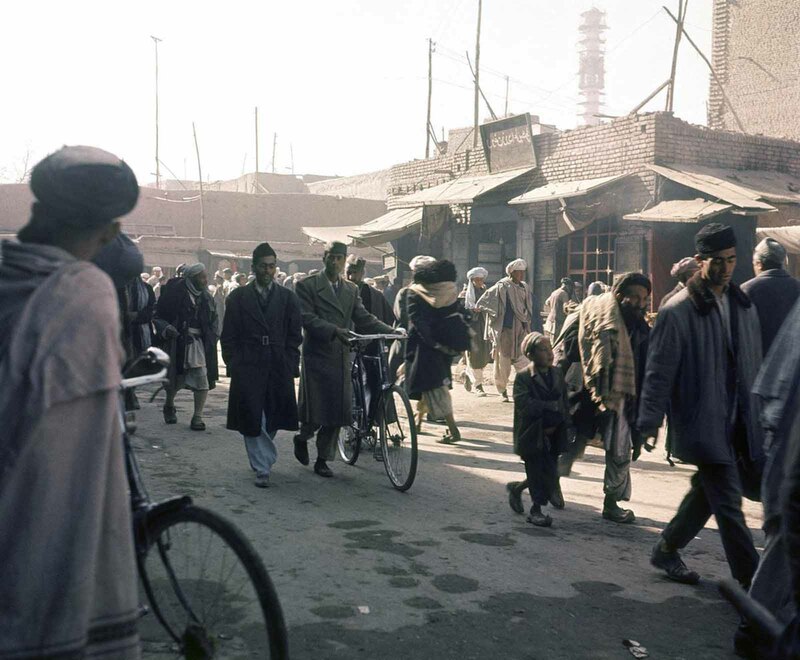 Street scene in Kabul, Afghanistan in November, 1961. 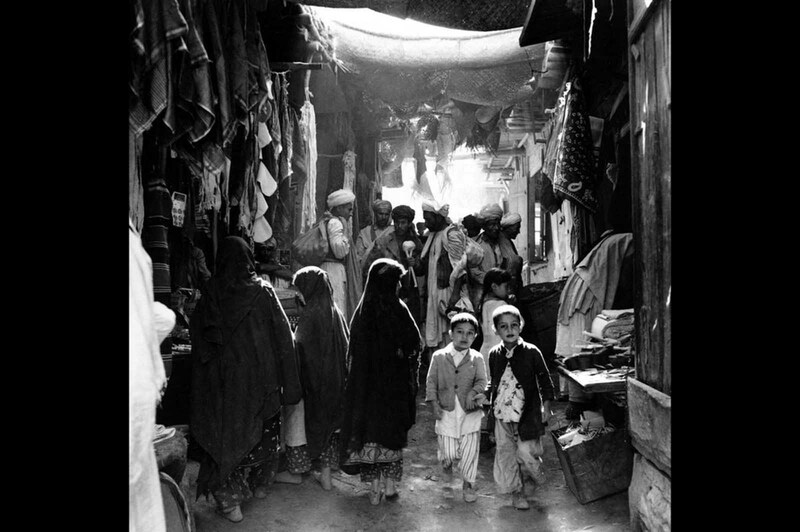 Afghan boys, men, and women, some in bare feet, shop at a marketplace in Kabul, Afghanistan, in May of 1964. 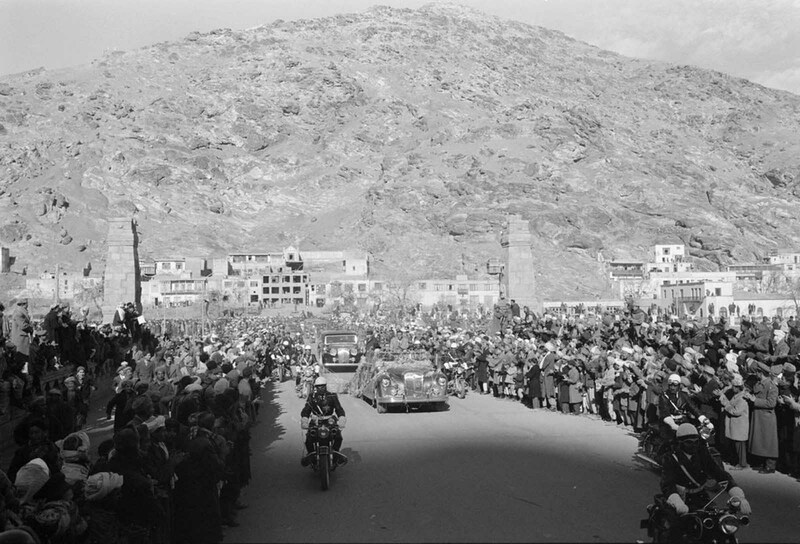 Motorcade for President Eisenhower’s visit to Kabul, Afghanistan, on December 9, 1959. Eisenhower met briefly with the 45-year-old Afghan king, Mohammad Zahir Shah, to discuss Soviet influence in the region and increased U.S. aid to Afghanistan. 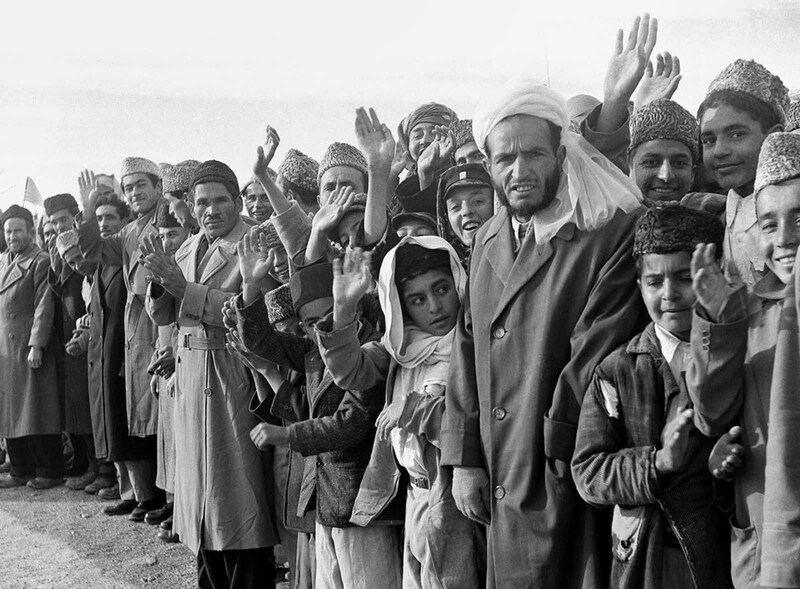 Residents of Afghanistan line the route of U.S. President Dwight Eisenhower’s tour in Kabul, Afghanistan, on December 9, 1959. 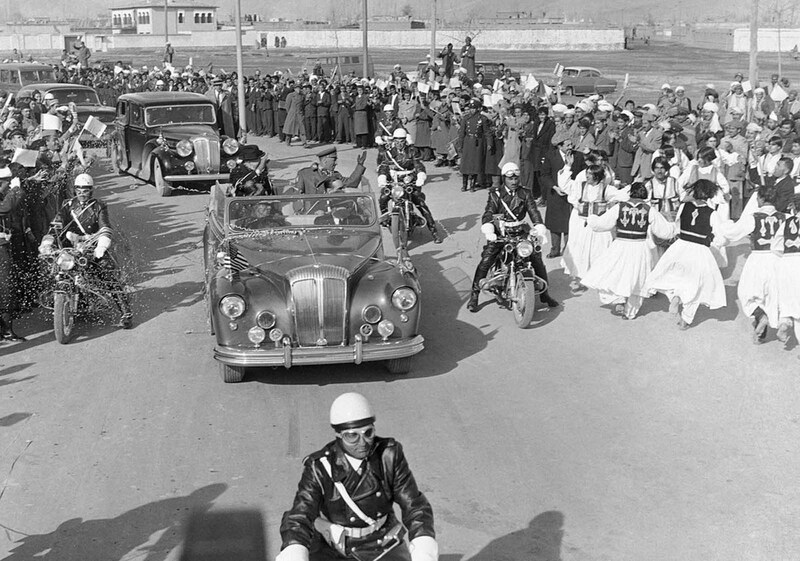 Dancers perform in street of Kabul, Afghanistan, December 9, 1959 following President Eisenhower’s arrival from Karachi. After a five hour stay in Kabul, Ike flew on to New Delhi. 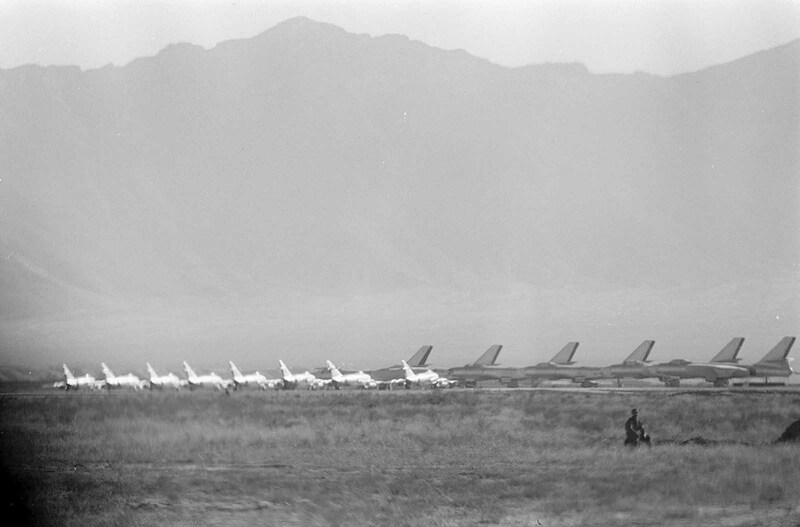 Afghan Air Force Mikoyan-Gurevich MiG-15 fighters and Ilyushin Il-28 bombers in Kabul, Afghanistan, during the visit of the U.S. president Dwight D. Eisenhower, in December of 1959. 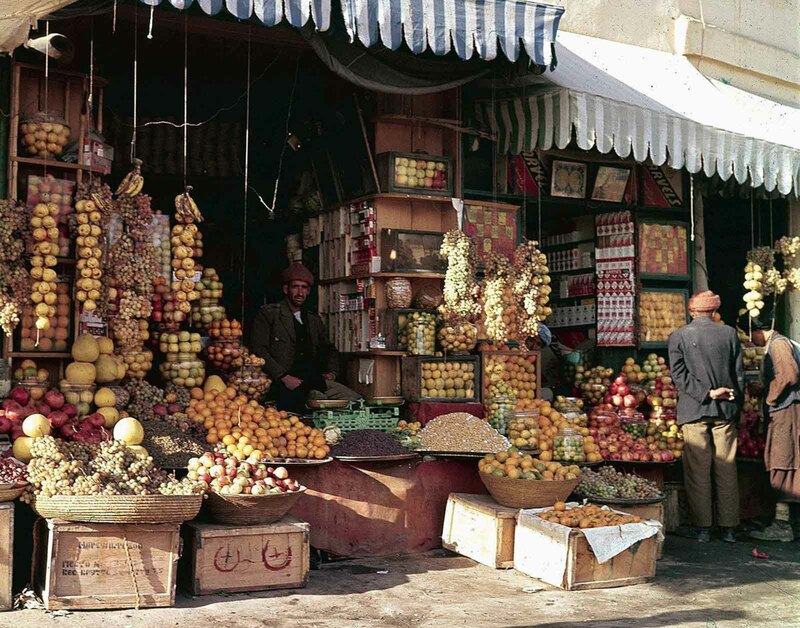 A shopfront display of fruits and nuts in Kabul, in November of 1961. 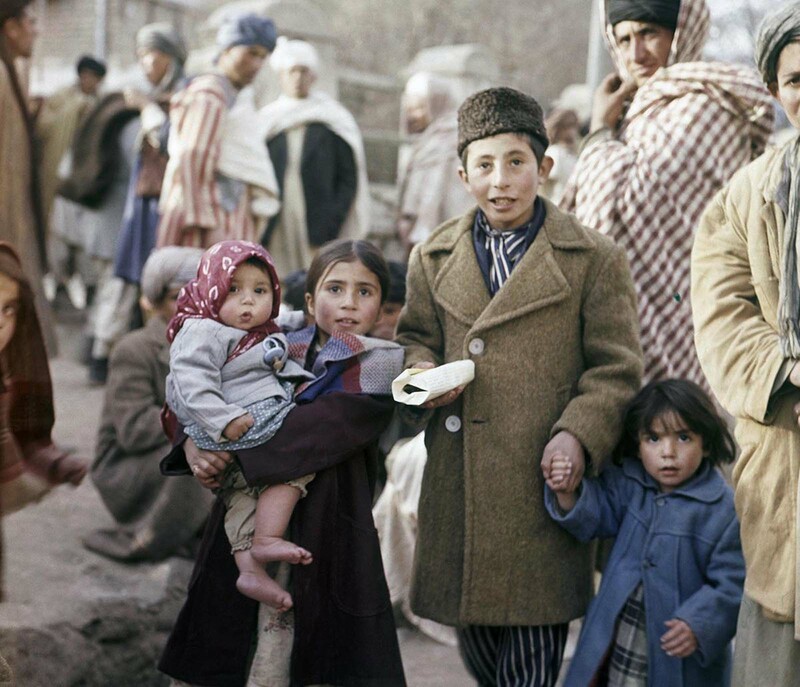 Children in a Kabul street, November, 1961. 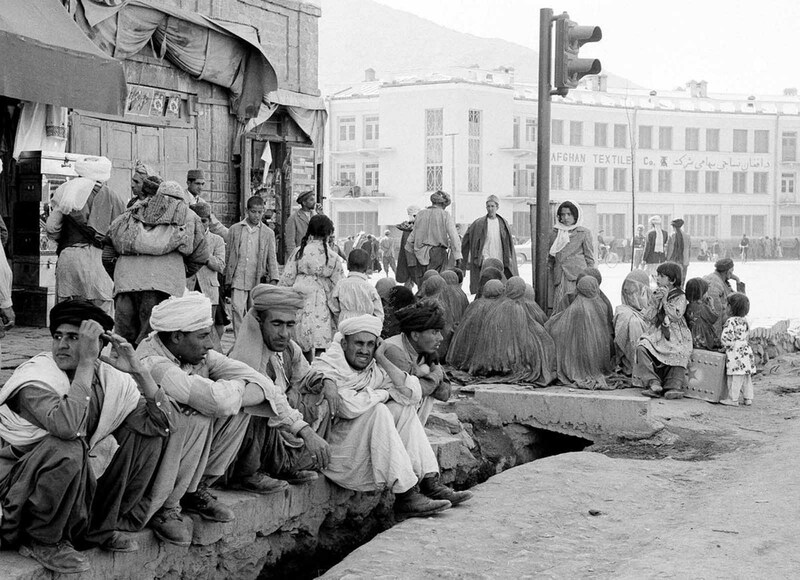 A modern traffic light stands incongruously amid burqa-clad women sitting on a Kabul street corner with their backs to their men on May 25, 1964. 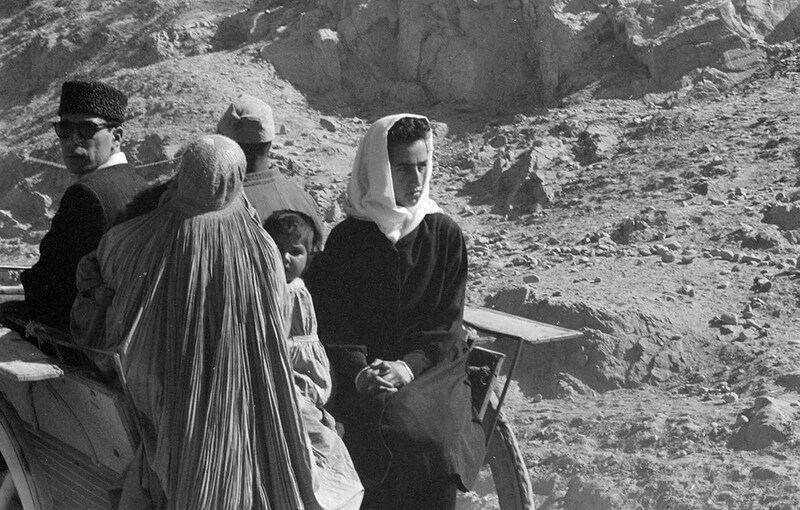 Afghan women, men, and child in traditional dress ride in a cart through an arid, rocky landscape, November, 1959. An Afghan worker checks a Russian-made truck in the Kabul Janagalak factory in an unspecified date. 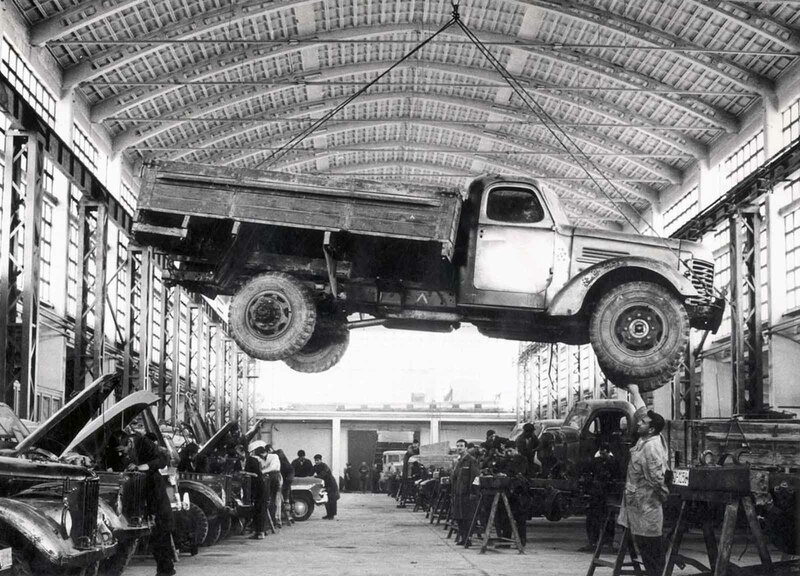 The factory situated in the center of the city as the only firm for making vehicle’s chassis was plundered, like other public properties in the Afghan capital, during the Afghan mujahedin rule from 1992 to 1996. The entrance to the Karkar coal mine around 12 kilometers northeast of Pulikhumri, the provincial town of the Northern province of Baghlan. 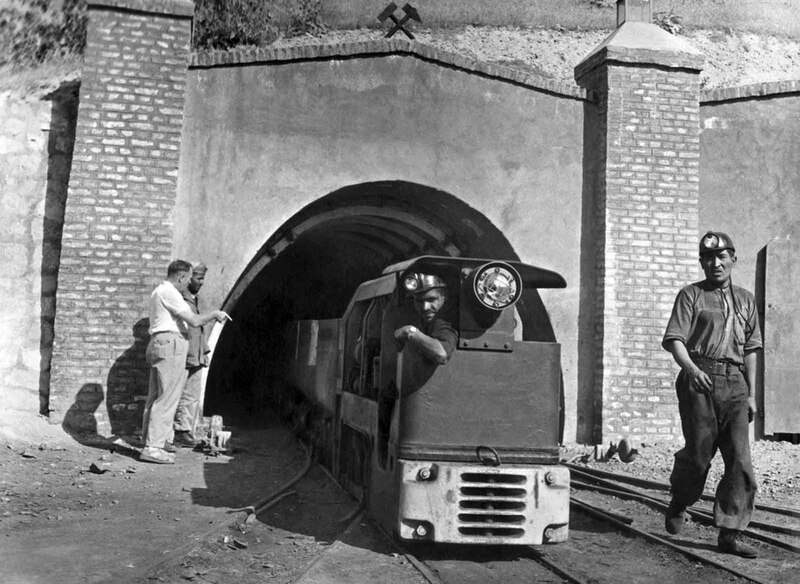 The Karkar coal deposit at one time met the needs of Kabul city. A caravan of mules and camels cross the high, winding trails of the Lataband Pass in Afghanistan on the way to Kabul, on October 8, 1949. 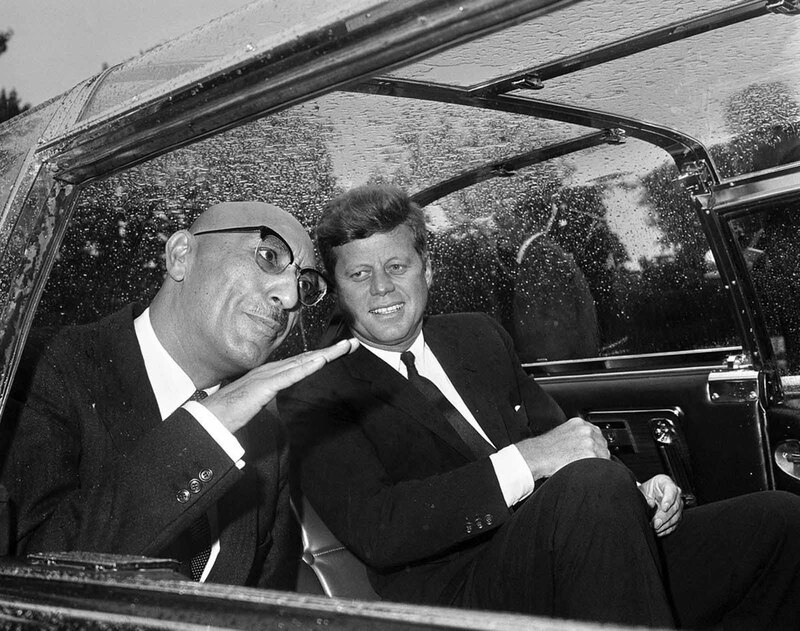 In Washington, District of Columbia, Afghan King Mohammad Zahir Shah talks with US President John F. Kennedy in the car that took them to the White House on September 8, 1963. 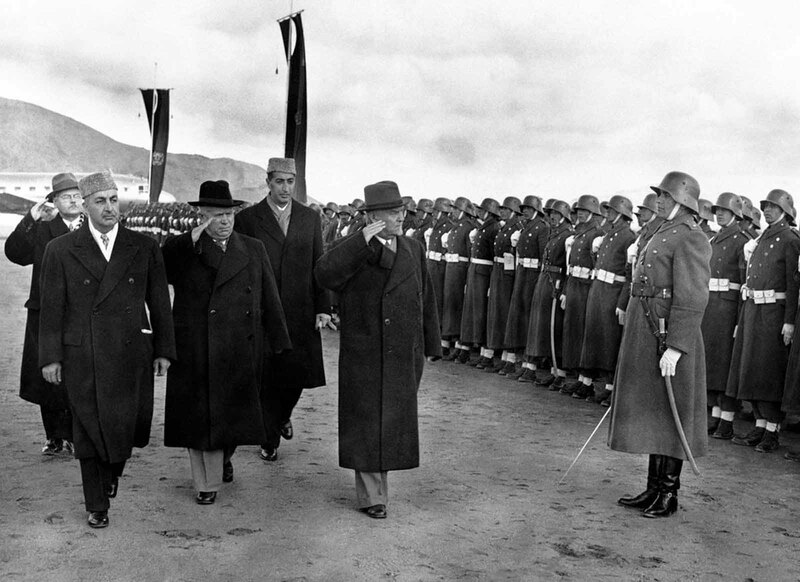 Soviet leader Nikita Khrushchev (black hat), and Marshal Nikolai Bulganin review an Afghan honor guard wearing old German uniforms, on their arrival in Kabul, Afghanistan, on December 15, 1955. At left is the Afghan Prime Minister Sardar Mohammed Daud Khan, and behind, in cap, the foreign minister, Prince Naim. 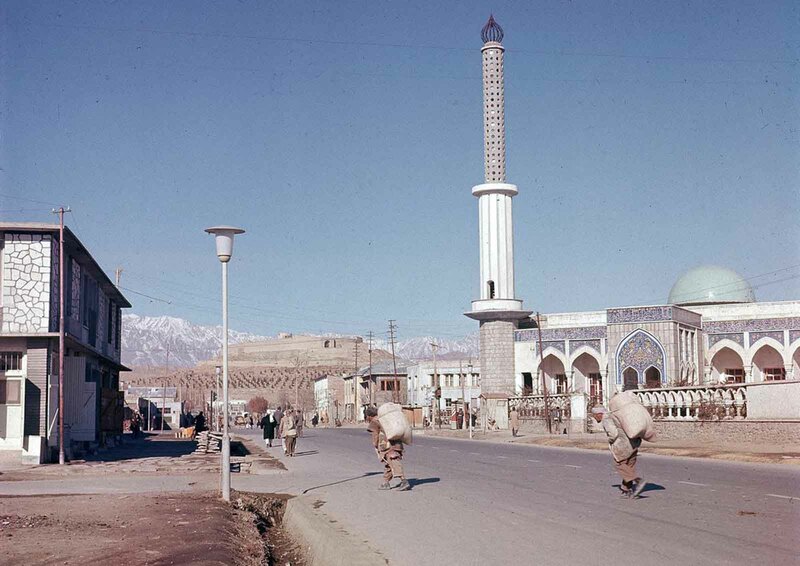 Street scene in Kabul, in November of 1966. 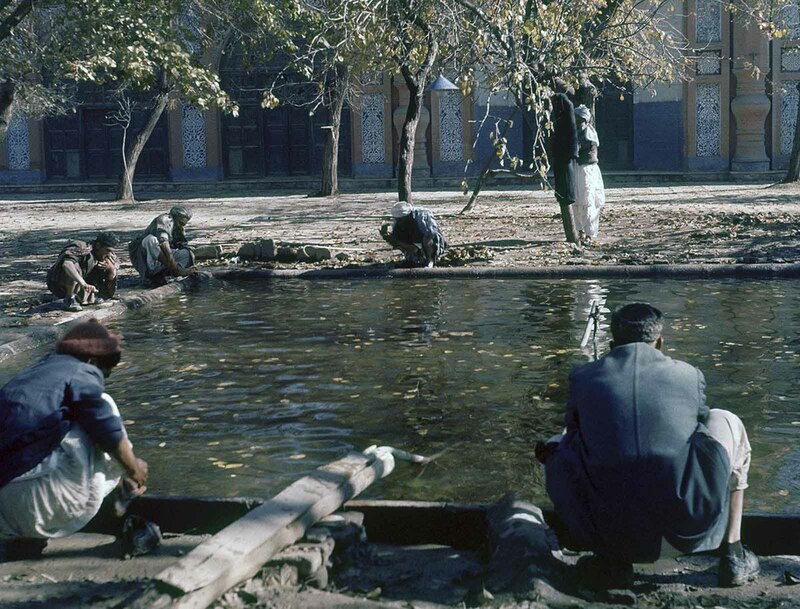 Activity in a city park in Kabul, on May 28, 1968. 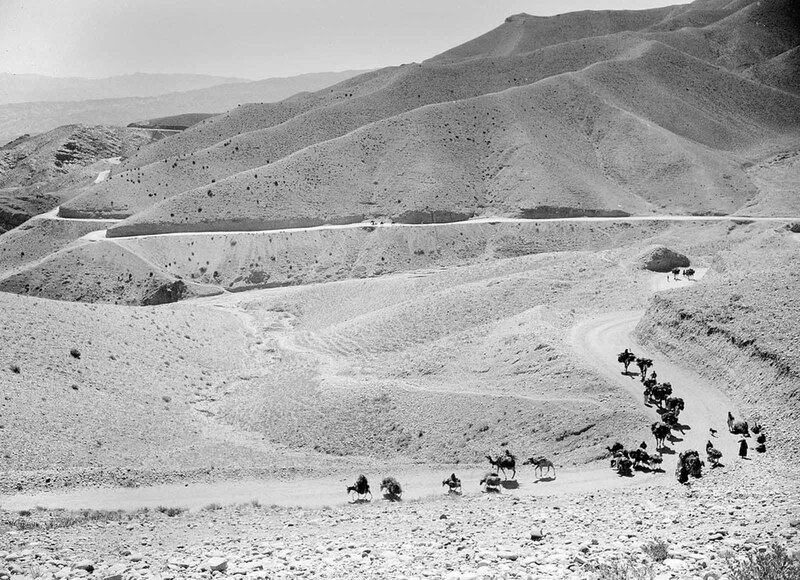 This photo shows the now-destroyed Kabul-Herat highway, that linked the Afghan capital to the Iranian border city of Mashad. 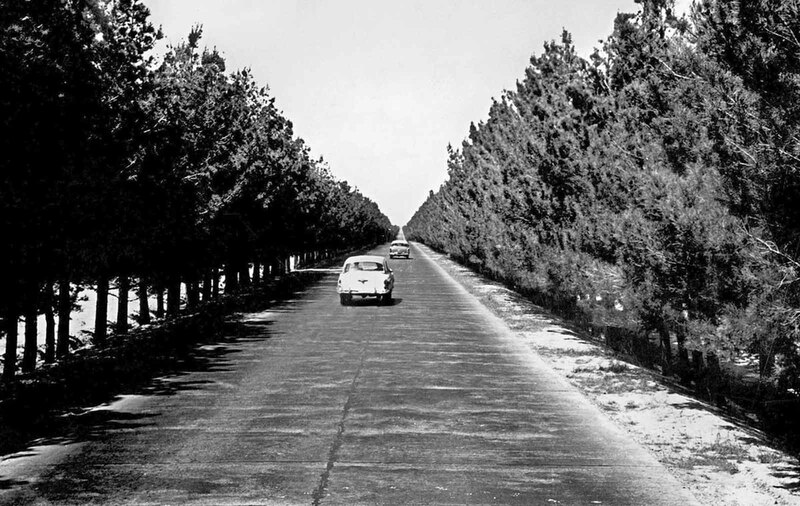 Built in the early second half of the 20th century, the highway has been virtually destroyed through decades of warfare. 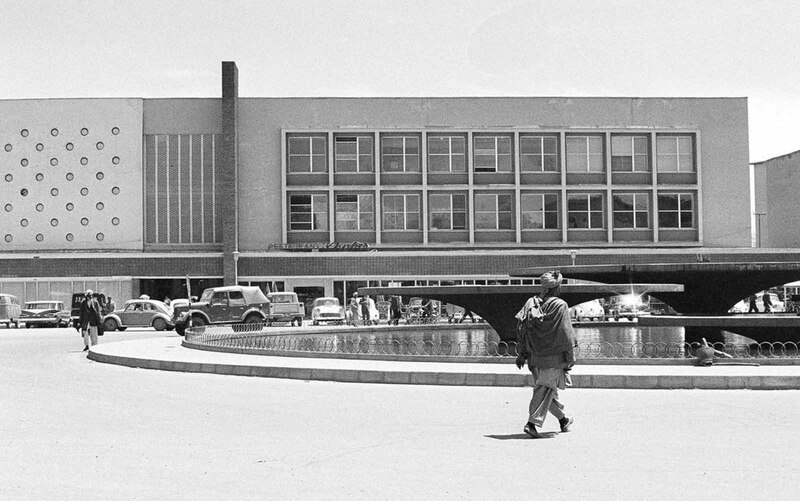 Modern new Finance Ministry building in Kabul, on June 9, 1966, with a public, western-style cafeteria and sidewalk restaurant, facing a water fountain which is illuminated in color at night. 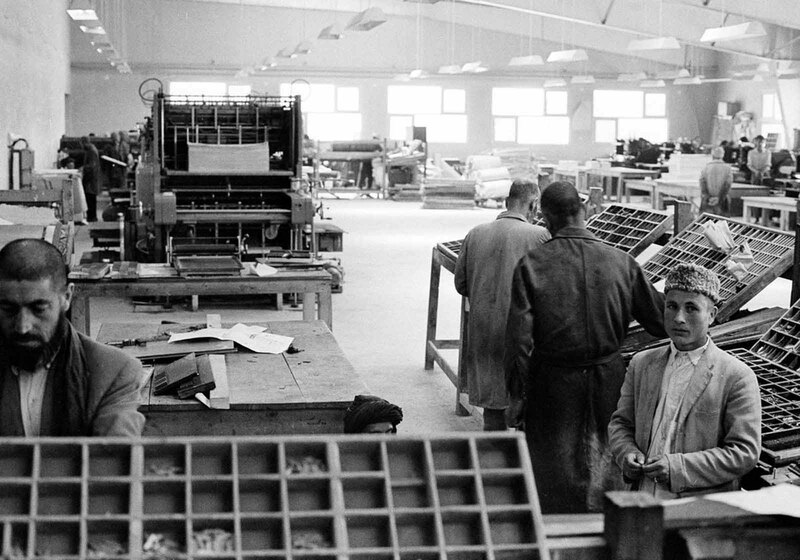 Scene inside the modern new government printing plant in Kabul on June 9, 1966, which houses Kabul Times. 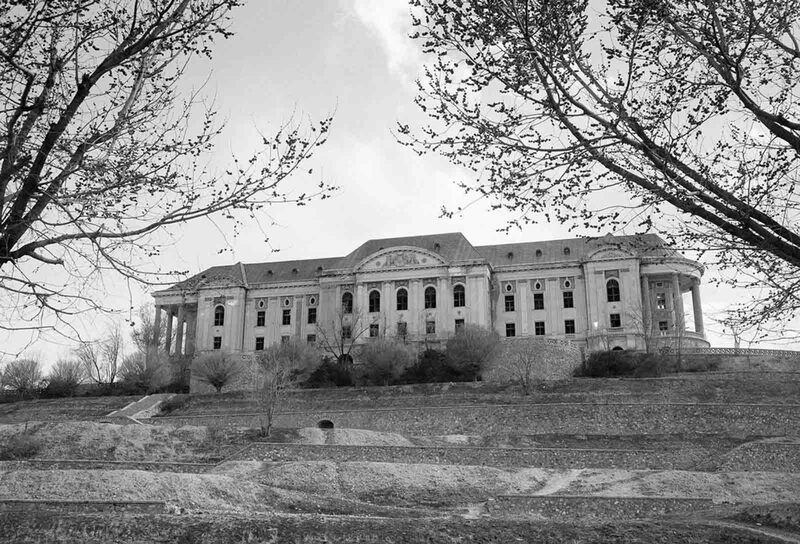 Tajbeg (Queen’s) Palace, the Palace of Amanullah Khan in Kabul, photographed on October 8, 1949. Amanullah Khan, King of Afghanistan in the early 20th century, attempted to modernize his country and make many reforms to eliminate many age-old customs and habits. His ambitious plans and ideas were based on what he had seen during a visit to Europe. 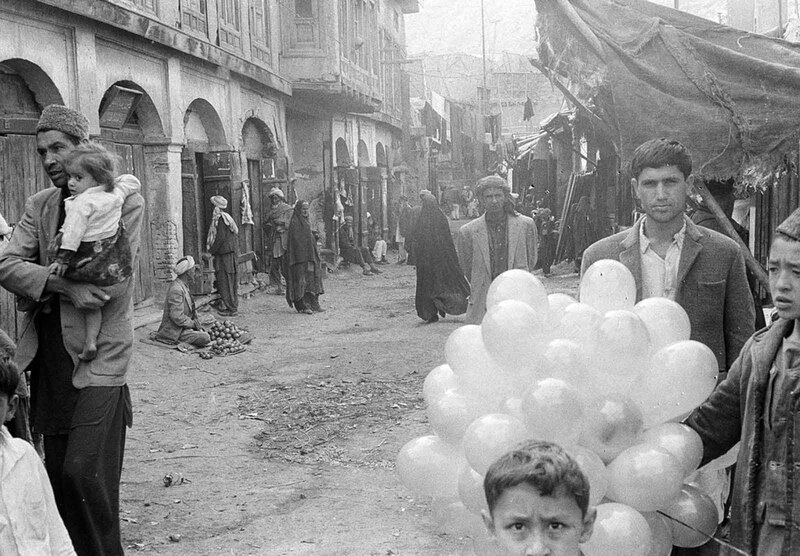 A quiet scene in a street through the bazaar of Kabul, on December 31, 1969. 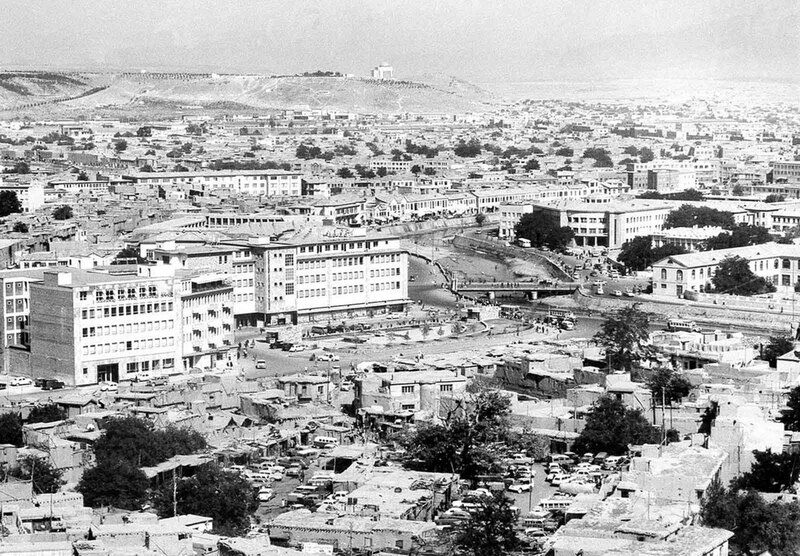 A panoramic view showing the old and new buildings in Kabul, in August of 1969. The Kabul River flows through the city, center right. In the background on the hilltop is the mausoleum of late King Mohammad Nadir Shah. 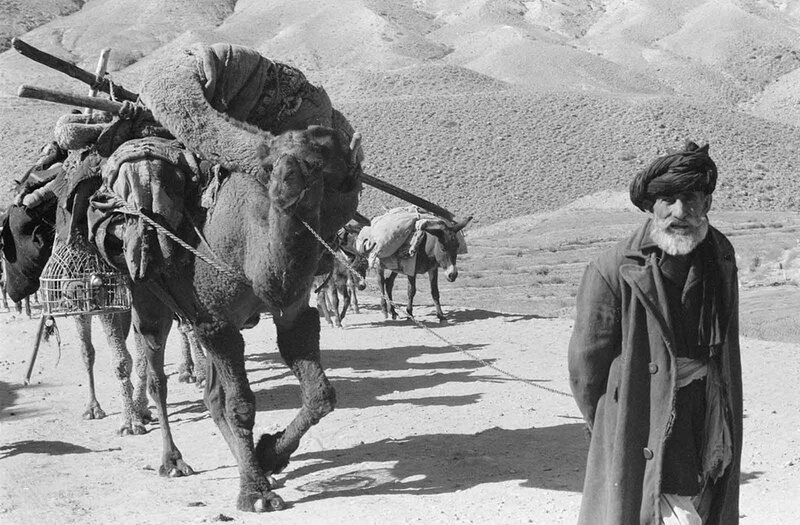 Afghan man leading laden camels and donkeys through an arid, rocky landscape, in November, 1959. 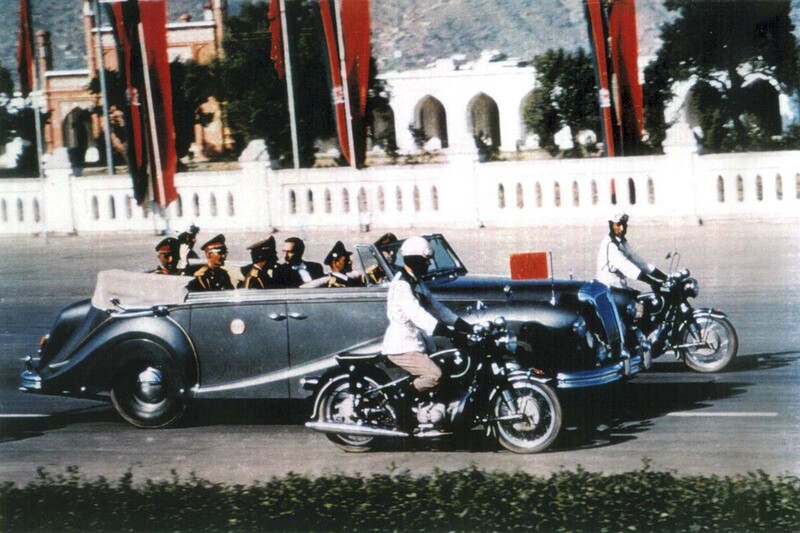 The King of Afghanistan, Mohammad Zahir Shah rides in his limousine on Kabul’s central road Idga Wat in this 1968 photo. Zahir Shah, the last of King of Afghanistan lived in exile in Rome since a 1973 coup, returning to Afghanistan in 2002, after the removal of the Taliban. He passed away in Kabul in 2007, at the age of 92. Afghan boys play with kites as men walk past, in November of 1959. 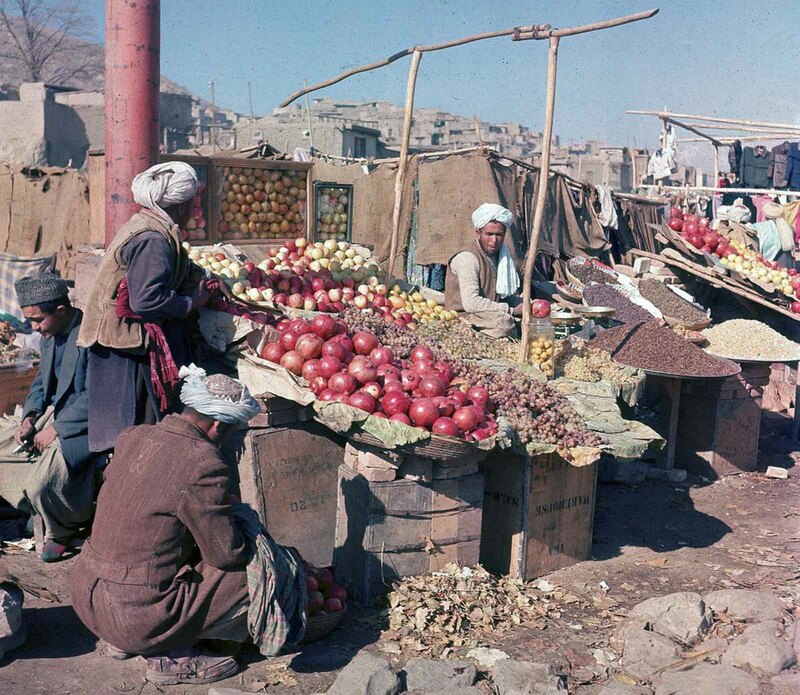 Vendors sell various fuits and nuts at an outdoor market in Kabul, in November of 1961. 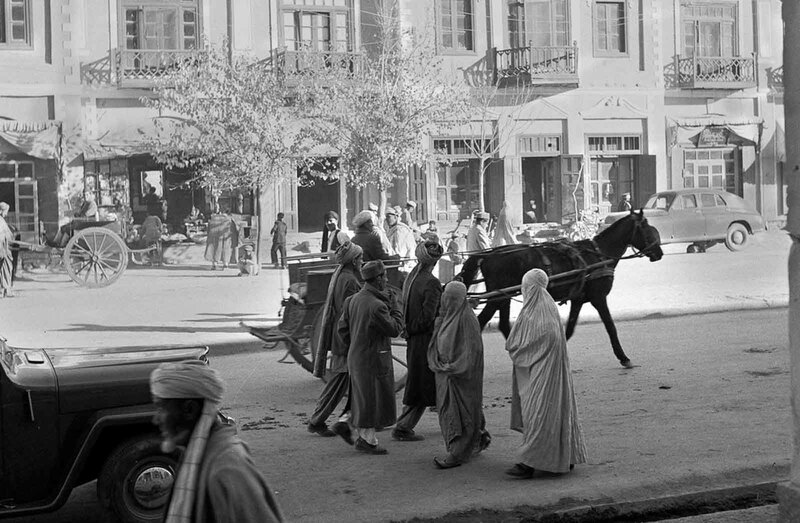 Women, wearing traditional burqas and Persian slippers, walk alongside men, cars and horse carts, in a street in Kabul, in 1951. At the time, this street was one of only three paved streets in the capital city. 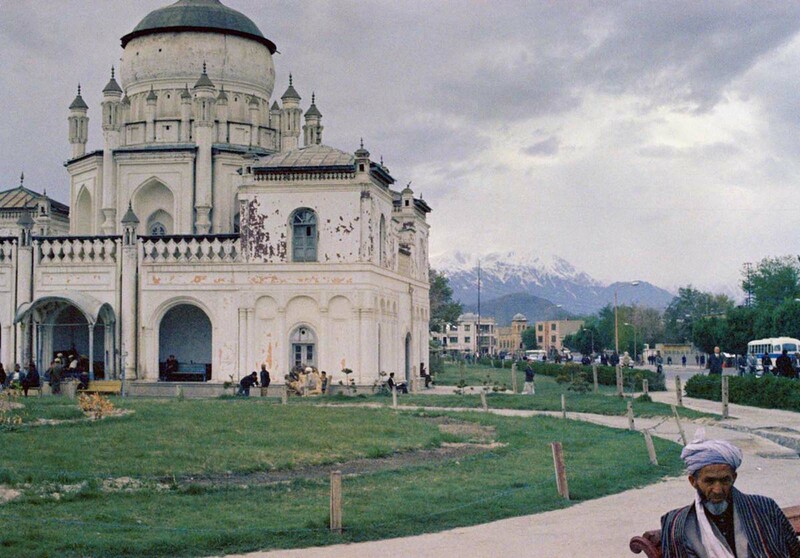 A view of one of the new mosques erected in the suburb of Kabul, in November of 1961. 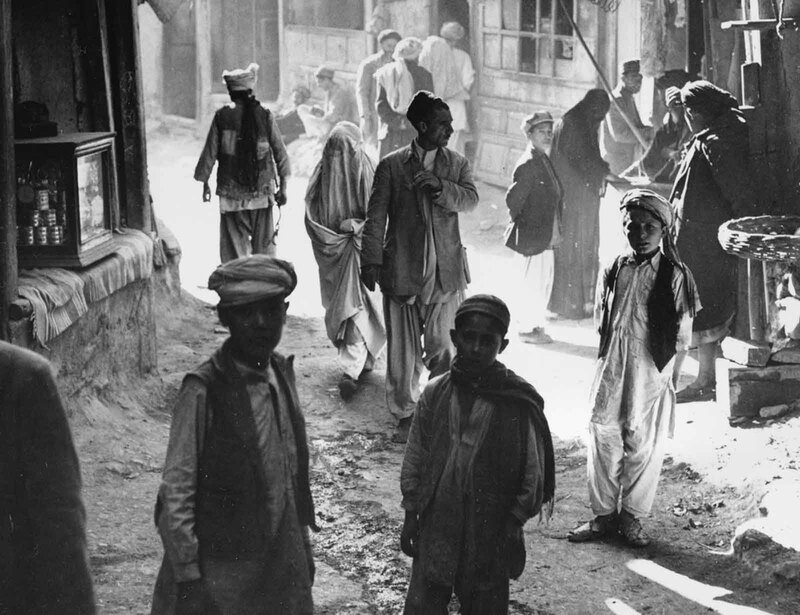 Afghan boys, men, and a woman walk through a street in Kabul, Afghanistan, on March 26, 1954. (Photo credit: AP Photo / Getty Images). Allan Ritchie..underneath the photograph it states.. Soviet leader Nikita Khrushchev (black hat), and Marshal Nikolai Bulganin review an "Afghan honor guard wearing old German uniforms" ..I think it's the German-made M18 stahlhelm which entered Royal Afghan Army use in the 1930s and was still in use in the 1970s. It was just a basic steel combat helmet which become symbolic of the pre-1973 era in the country. The were easily recognized by the black-red-green “triple triangle” symbol which was on the pre-1973 helmets. 60 years ago, if you look at pictures in 2017 I bet you'd struggle to tell the difference in some of those scenes​. It's a real shame, honestly.